Where are all of these jobs the sugar industry claims are the reason for maintaining the status quo in the Everglades Agricultural Area? The truth is that they are so few and far between that there is plenty of room for green jobs, the kind of jobs that can sustain families, the local economy, and the environment. The end of pre-harvest sugar field burning and true Everglades restoration, along with a movement to bring justice and equity to the residents of the Glades, can combine to bring new economic opportunities to the communities that ring Lake Okeechobee. So how do we get from here to there? 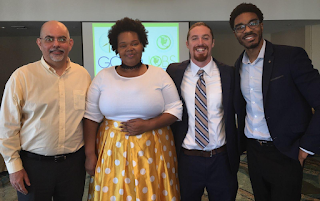 At the 2019 Everglades Coalition Conference, a panel explored how the fight for social, economic, and environmental justice go hand in hand and how green jobs should and can be a part of the near future of the Everglades Agricultural Area. Kina Phillips, a lifelong South Bay resident and a local activist, started the conversation by presenting the standing room only audience with an overview of the current economic realities facing of the Glades communities and the environmental injustice caused by pre-harvest sugar field burning. Her description of the lack of economic opportunities and high unemployment rates in the Glades emphasized the need for a change from the current state of things in Western Palm Beach County. She highlighted how this change needs be driven by the community itself and that the future of her Glades neighbors should not and cannot be driven solely by the interests of the sugar industry. For Kina, the time for allowing the sugar industry to portray themselves as the voice of Glades residents is over. It is time for the working people in the Glades to explore the job development opportunities that an end to pre-harvest sugar field burning would bring; that means more sugar industry jobs to manage the trash (leaves and tops) and jobs that have been kept out of the community because the annual blanket of smoke runs business interests and business people out of the Glades. She inspired all present with her determination to speak out against current injustices within the Glades in favor of a more equitable, sustainable, and healthy future for her beloved community. 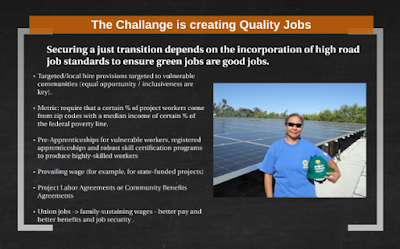 Larry Williams, Jr. of the Sierra Club Labor Program talked about just transition, a concept that relates to how we change from an unjust, unsustainable economy to an equitable, green one. Larry shared that a just transition will look different in different places, and that it is important for the community members themselves to shape the type of transition that best suits their interests and needs. He illustrated current examples of just transitions that are being ensured through collaborative efforts between community organizations, local governments, and local businesses around the country where old, hazardous dirty coal jobs have been replaced with training programs and clean-energy jobs that can support a family. The models are there for the people of the Glades to use and modify to create a just transition from pre-harvest burning to green harvesting. Sierra Club’s just transition work seeks to promote equitable access to clean-energy related and green jobs for all, especially vulnerable communities and individuals. 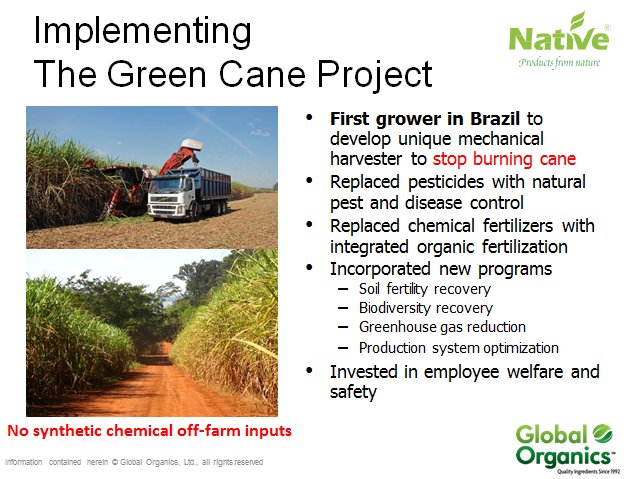 After Larry spoke it was time for Andrew Martino from Global Organics Ltd. to blow our minds with the details of how the switch to green harvesting in Brazil has increased profits and improved the health of workers and neighbors of Grupo Balbo’s Green Cane Project. 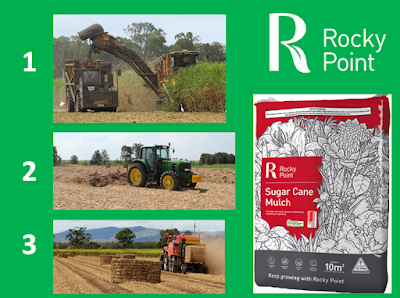 Grupo Balbo is one of the largest organic agricultural projects on earth with over 54,000 acres of certified organic sugarcane; their sugar is sold under the "Native" brand name. Andrew shared how Grupo Balbo pioneered green harvesting in Brazil thirty-five years ago. Since its inception they have phased out pre-harvest sugarcane burning and have created a 100% carbon-neutral farming operation that replaces chemical fertilizers and pesticides with natural alternatives. In addition to sugar, they utilize the whole plant to produce organic ethanol, biodegradable plastics, alcohol, animal feed, and enough electricity during the harvesting season to power a city of hundreds of thousands of people. Andrew covered how in addition to remaining profitable they provide generous support to their employees including profit sharing programs, social and educational programs, and subsidized medical care for all 5,000 employees and their families, a community of over 12,000 people. If Brazil can do it why can’t Florida? Due to the federal government shutdown, Dr. Isabel Lima, a research chemist with the United States Department of Agriculture (USDA) Sugar and Energy Project, was unable to attend the conference. But Dr. Lima provided slides for Patrick Ferguson, Organizing Representative on the Stop Sugarcane Field Burning Campaign, on sugarcane-based biochars currently being produced from green harvested sugarcane by American Biocarbon. 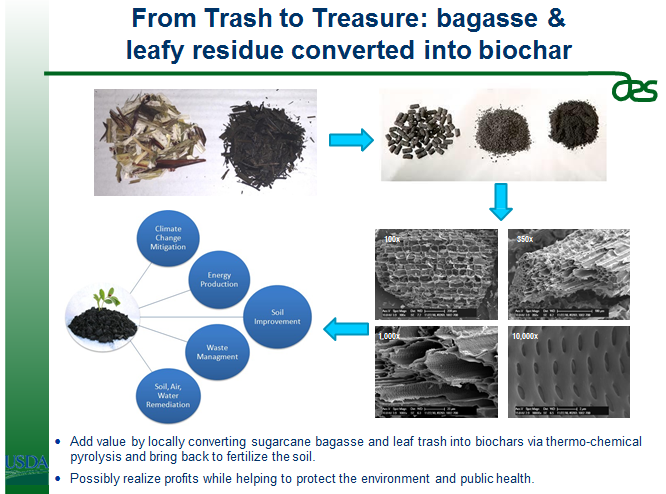 American Biocarbon, in partnership with the Cora Texas sugar mill in Louisiana, utilizes sugarcane trash and bagasse to make biocarbon pellets, a sustainable biomass fuel source. Dr. Lima’s research also illustrates that biochar can be used as an effective organic fertilizer as well as a sorbent for water filtration systems. If Louisiana can do it why can’t Florida? Patrick then took the audience to Australia for another example of the green harvest-green job potential: Rocky Point Mulching. Rocky Point Mulching profitably markets sugarcane trash from green harvested sugarcane as commercial mulch. If Australia can do it why can’t Florida? Florida can do it! It is possible to imagine and create a just transition for the Glades. We can ensure a true win-win-win situation if we refuse to accept anything less. 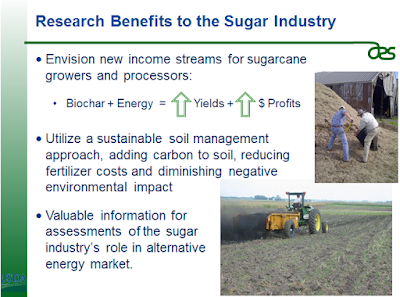 There can be good green jobs and business opportunities for residents, a more equitable and sustainable local economy for all, and more profits for the sugar industry if we end the outdated practice of pre-harvest sugar-field burning and build a new green harvest-based economy. What’s next? How do we use this just transition discussion as a jumping off spot for much more to come? Contact Patrick Ferguson to join the conversation (patrick.ferguson@sierraclub.org). Join our STOP THE BURN campaign!